These steamed buns come from Philippines and are called Siopao. You can fill them with anything you want! 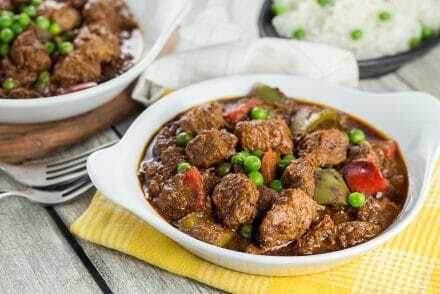 I made mine with a delicious chicken curry filling and they turned out amazing! When you make dishes from all over the world on a daily basis, you always face some products or cooking techniques you have never tried before. Often these new things look suspicious to you, because, obviously, they are not from your culture and you are not used to them at all. It’s normal. When I made these Steamed Filipino Buns, called Siopao for the first time, I didn’t know how they will turn out. Mostly because I had never tried steaming the dough before. All my doubts were cleared when I took a bite of this divine bun. I don’t even know how to describe the taste of the steamed dough, but it’s so good! I might have even loved the dough more than the filling itself. Seriously! Siopao has Chinese roots. 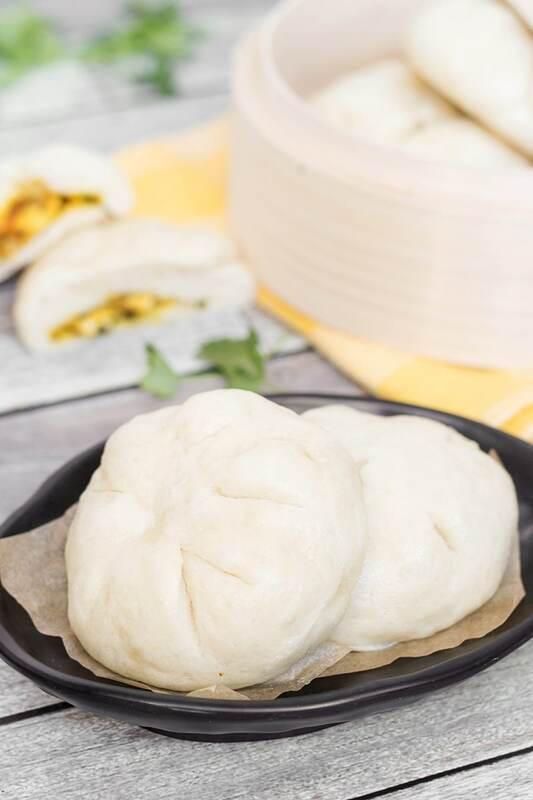 In China these buns are called Baozi. Both names literally mean “steamed buns”. Siopao is popular in the Philippines and Thailand nowadays. You can find these white soft buns sold everywhere in the streets of the Philippines. The variety of fillings is endless! You can stuff siopao with pork, beef, seafood, poultry, eggs, vegetables, and so forth. I decided to go with a chicken, because it’s my favorite type of meat. Just remember to cook the filling well before steaming the buns. The steaming is quite short so the meat won’t cook through. What? Chicken filling is boring? Oh no, my dear reader. Don’t you dare to think that I stuffed these heavenly buns only with chicken and nothing else. The filling also features garlic, tomato, green onions, coconut milk, soy sauce, lime juice, and curry paste! What about such a combination? Is it better now? I bet it is! The flavor is fantastic. What I love the most about the siopao is that both the dough and the filling are incredibly tasty. Oh and that these buns do not require any utensils – you can have them on the go! The chewy steamed dough was a fabulous discovery to me. Since the first time I tasted it roughly a year ago, I’ve been hooked. I probably made siopao over 10 times already. Every single time with a different filling! Forget for a moment about your oven and try these incredibly tasty buns made in a steamer. You won’t regret it! 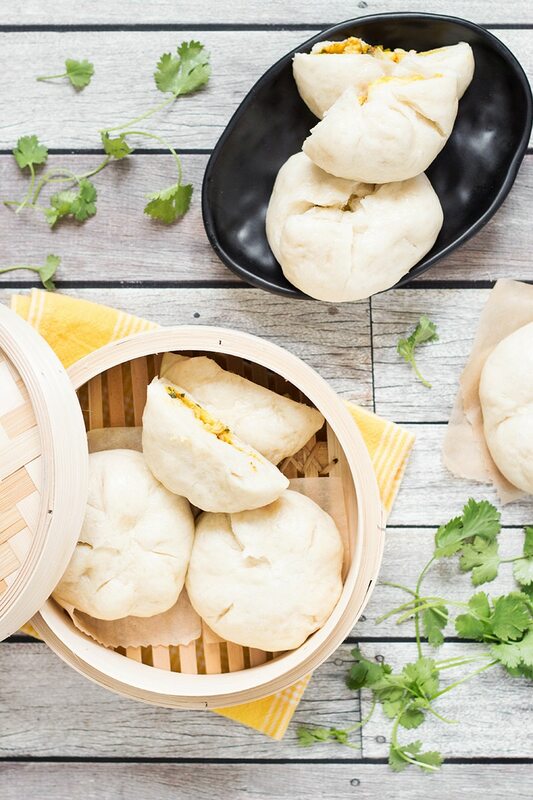 These steamed Filipino buns make a great snack. They are filled with the amazing chicken curry filling and are incredibly tender! The dough. In a small bowl, dissolve the yeast and sugar in the warm water. Set aside for 5 minutes, until the yeast is activated. It should become foamy. Add 2 tablespoons olive oil to the yeast mixture and set aside. In a large bowl, combine the flour and salt together, Pour the yeast mixture into the flour and salt mixture and mix until you get the dough. Place the dough onto a lightly floured surface and knead for 5 minutes, until it is smooth. When ready, place inside a lightly oiled bowl. Cover with plastic wrap and allow the dough to rest for 1 hour. The filling. Heat 1 tablespoon olive oil in a skillet. Add the garlic, tomato, green onions, and cook for 2 minutes, until the tomato softens. Add the curry powder, chicken, coconut milk, chicken stock, and soy sauce. Cover and simmer for 10 minutes, until the chicken is cooked. Uncover and cook for 5 minutes more, over high heat, until the sauce thickens. Remove from heat and stir in the lime juice and cilantro. Season with fresh ground black pepper to taste. Let the filling cool for 5-10 minutes. The buns. Punch the dough down to release the air. Place it onto a lightly floured surface and roll into a log. It should be about 12-inch (30cm) long. Divide the dough into 10 pieces. Work with one piece at a time covering other pieces so they don't become dry. Take one piece of the dough and flatten it with the palm of your hand into a 6-inch (15cm) circle (approximately). Place 2 tablespoons of the filling in the center of the circle and draw up the sides together at the top of the bun. Pinch and twist the top to seal it. Place the bun on a little square (3x3 inch or 7x7cm) of parchment paper. Continue with the remaining buns. 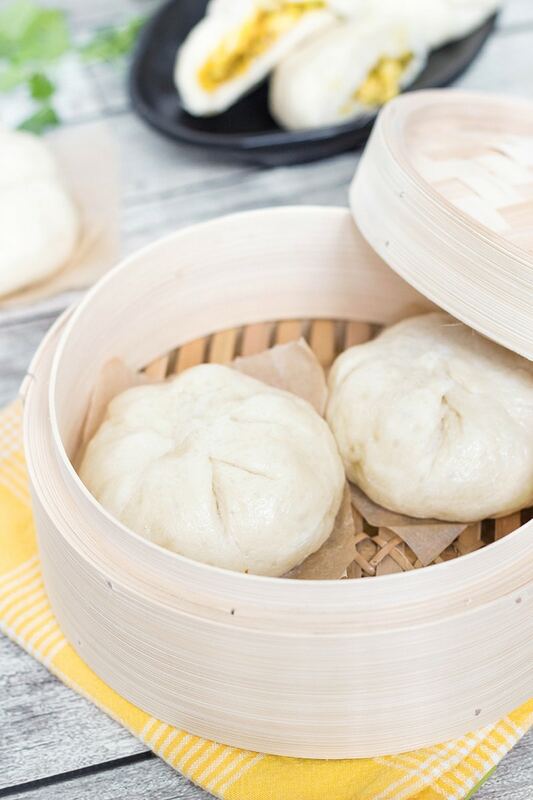 Cook the buns in a steamer for 12-15 minutes. Enjoy! Hi Igor! Your site is beautiful and your food looks amazing!! 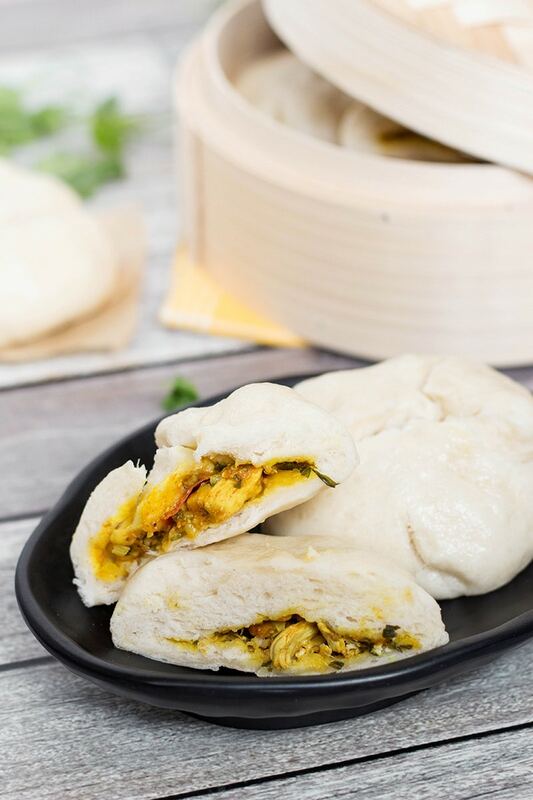 These Steamed Filipino Buns look divine – literally my mouth is watering just thinking about them. I LOVE the filling you used! The coconut milk, soy sauce, lime juice, and curry paste combo sounds heavenly. I’m gonna have to give these a try!! Steamed buns blew my mind when I first had them. Soft, chewy and a bit sweet, they formed such a beautiful contrast to the vibrant and spicy filling inside… I was hooked! Love this curried take. I’m such a sucker for steamed buns — and your filling sounds phenomenal. I’m pretty sure I could eat a bakers dozen of these! Oh I loved steamed buns, I had some stuffed with mushrooms the other day and they were lush. I love steamed buns and curry so this is a winning combination in my books. I have never tried making this type of bun, but I do get them when I go out. Perhaps it’s time I made them at home. 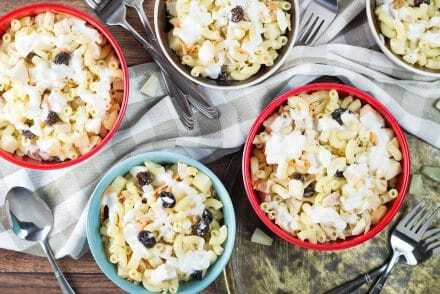 Thanks for sharing the great recipe. I love the flavors you’ve used in your filling. Taking steamed buns to the next level! I wish I had some for lunch! Thanks for the stopping by to comment, Amanda! Hi, Igor. I’m Filipina and I LOVE SIOPAO! I was just thinking along the same lines of stuffing the dough with all kinds of other things. What other fillings have you used that pairs nicely with the sweet bread? Becca, you definitely have to try these buns. 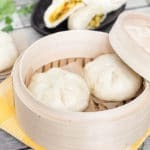 Siopao are really easy to make! Nicely explained. They seem to be delicious and since they are steamed N not deep fried I would love to pick one. They are definitely my MOST Fav dish when I visit a Filipino restaurant but I’ve never tried them at home. Your recipe looks great and will try soon. These are so beautiful. I have a steamer, but I must admit that I haven’t used it yet. This has inspired me to use it now.